A well-made guitar at a great price - what's not to like? Reviewed finish won't be for all. By paying homage to classic designs at affordable price tags, Vintage has earned a decent reputation. 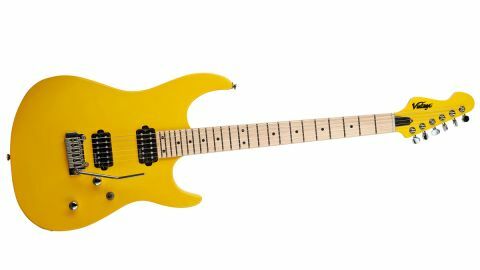 The company's new 80s-vibed V6M24 continues the theme, with a svelte body that appears to be a doff of the cap to the hot-rodded 80s double-cuts of brands such as Charvel and Suhr. You can't shake the feeling this Daytona Yellow model should ship with sunglasses in the case. It's garishly flamboyant, no doubt, but if it seems a bit much you may be relieved to learn that this isn't there are two subtler, albeit only slightly, colours in this range - Laguna Blue and Ventura Green. The V6M24 isn't particularly lightweight, but it's in no way an anchor, and we're surprised that it immediately feels well set up enough to plug-in-and-play, with only personal tweaks such as action height required. For such a low-priced guitar, we're braced for some corner-cutting which, at this price point, would be forgivable. But no: the fretwork, neck join and practically all facets of build here are top-notch and comparable to guitars four or five times the price. "It isn't a genre- spanning guitar, but then, does it look like one?" The neck is a slim, elliptical- shaped carve with enough girth to permit comfortable thumb-over- the-top chordal work, but skinny enough for the shredding your audience will no doubt be expecting. The frets have a medium-jumbo profile, so you can feel the unfinished smooth maple underneath your fingers, which should appeal to rock players who dislike sticky lacquered maple fretboards. A rock-friendly 355mm (14-inch) radius means that even the wildest of bends can be executed without choking, and you can nail a low action without any buzzing on lower frets. Even before plugging in, the V6M24 is an absolute breeze to play, and it begs the question: how on earth can a guitar that plays this well be so darn cheap? Through a dirty amp, the medium-high output Wilkinson pickups deliver a very balanced rock sound, taming the harsh high frequencies sometimes generated by high-output pickups on an alder/maple guitars. The output probably isn't hot enough for the shred-inclined player but certainly not too far off - the bridge pickup seems have been voiced for high-octane rock rather than all out metal, whereas the neck pickup produces warm classic rock tones with just a tiny bit of 'twang'. On a clean setting, we struggle to get any spanky funk tones; instead, there's a very full-bodied and rich tone that would work well for chorused clean passages. A coil-split would broaden the guitar's sonic appeal, but for this price, that really is nit-picking. The V6M24 isn't a genre- spanning guitar, but then, does it look like one? A certain amount of authority is required to stand up in front of crowd with a bright yellow axe, but if you possess such confidence, then rest assured, this guitar won't let you down on rock of any kind.